I’m a creature of habit. Once something works for me, I pretty much stick with it. I work out every day, so I can enjoy eating and having the occasional glass of wine. So far, so good. I do the crossword puzzle every morning. Exercises my brain. I wear a lot of black. Makes it much easier to shop. One pair of boots goes with almost everything. I can’t go to bed without kissing my daughter and my husband good night. It’s good luck. And I eat the same exact breakfast almost every day of my life. Two slices of whole wheat toast with jelly and a thin spread of almond butter (the kind you grind yourself at Whole Foods…it’s to DIE for! ), and a cup of dry cereal (Mother’s Peanut Butter Bumpers). I love the pear preserves I buy from the little farmer’s market at Hillsboro High School. There’s something about homemade jams and jellies…I think they taste so much better because of the love that goes into a batch of seasonal fruit, sweetened and cooked in small batches, just like my Grandma used to make. I always load up in October, the last month they’re there until the spring. For some reason, I didn’t get my normal stash this year. 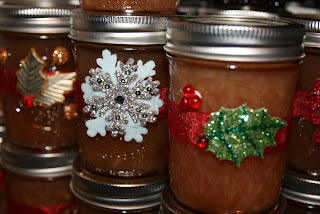 So when I saw a recipe in a magazine for homemade pear-vanilla preserves, it intrigued me. Looked pretty easy. So I tried some. I didn’t have the fancy canning pot that is huge and deep so that you can put the jars in with enough water to cover, so I used my big soup pot. It wasn’t too bad, except for the huge mess I had to clean up. **Note: don’t cook the fruit in a small saucepan…when it boils, it WILL boil over. The final product was beautiful, but the consistency…more like syrup. So I dumped it all back in the saucepan, added more pectin (extra, too, just in case), and it hardened so much over the next few days that I had to cut it out of the jars. 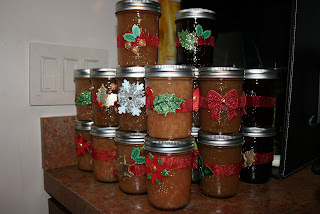 So I went back to the drawing board, and read everything I could get my hands on about jams and jellies. 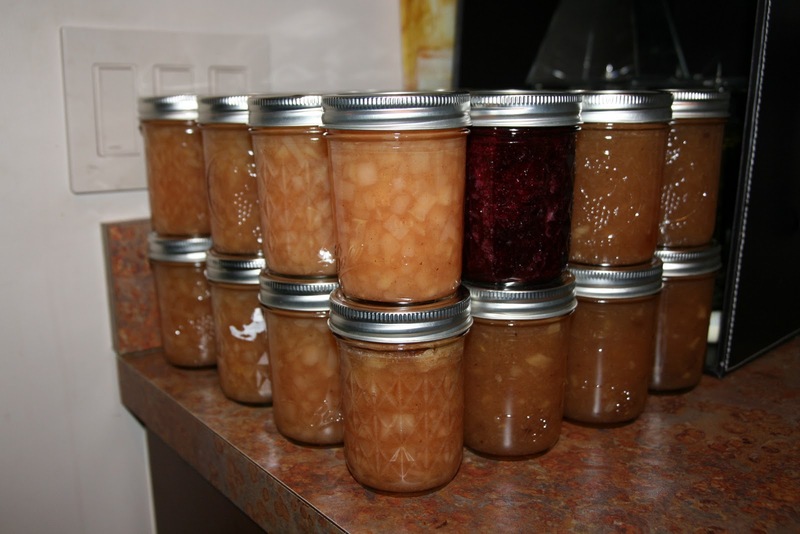 My grandma “put up” everything…fruit, vegetables, pickles, sauces, juice, and never really even used a recipe, but there are so many different recipes, and philosophies about making jelly it makes my head spin. So I went to Costco and bought three different kinds of pears, some jonagold apples and four pints of blueberries (I know, not in season, but my husband only likes purple jelly). Yesterday I spent the entire day in the kitchen, and after a couple of mishaps, I think I finally got it. The recipes in the pectin box call for only boiling for one minute…recipes without pectin call for cooking for a longer time, to extract the natural pectin from the fruit. I finally settled on a happy medium. I use a little less pectin, and boil for about 5 minutes, until I put a spoonful on a cold plate from the freezer and it cools off into a soft jell. I did use the full amount on the blueberries, since they don’t have much natural pectin in them at all, and they turned out perfectly. It was actually much easier to do the blueberry, because I didn’t have to peel, core, and chop them, like I did with the pears and apples. 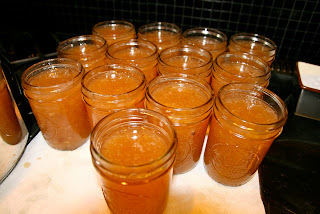 Anyway, for those of you who might want to give it a try, here’s my recipe for Apple Pear Jam. Prepare jars. I usually put in dishwasher on “sanitize” setting, before I start chopping. That way they’re warm when you put the hot jelly into them. Or you can boil them in a large soup pot or canning pot with something in the bottom to prevent them from touching the bottom of the pan. Before I purchased an actual canning pot with bottle insert, I put a metal trivet in the bottom of my soup pot…it worked fine. 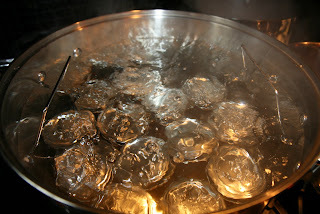 Pour boiling water over flat lids in saucepan off the heat, keep in water until needed. Wash and dry screw bands. 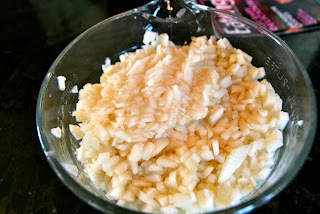 Put about 1/4 cup of lemon juice in bowl, more if needed. Peel, core and finely dice fruit, tossing with lemon juice as you chop to prevent browning. If you want smoother final product, you can put in food processor or food mill. Put small glass bowl or plate and spoon in freezer. Measure exact amount of the fruit (with lemon juice) into a large, deep saucepan. Don’t make a batch larger than 8 cups, or it will take too long to set. Measure exact amount of sugar in separate bowl, remove 1/4 cup of measured sugar and mix with a little less than one full box of Pectin in a small bowl. Stir pectin-sugar mixture into the fruit , and bring to a full boil (one that doesn’t go away when you stir). You need to stir constantly to prevent sticking. 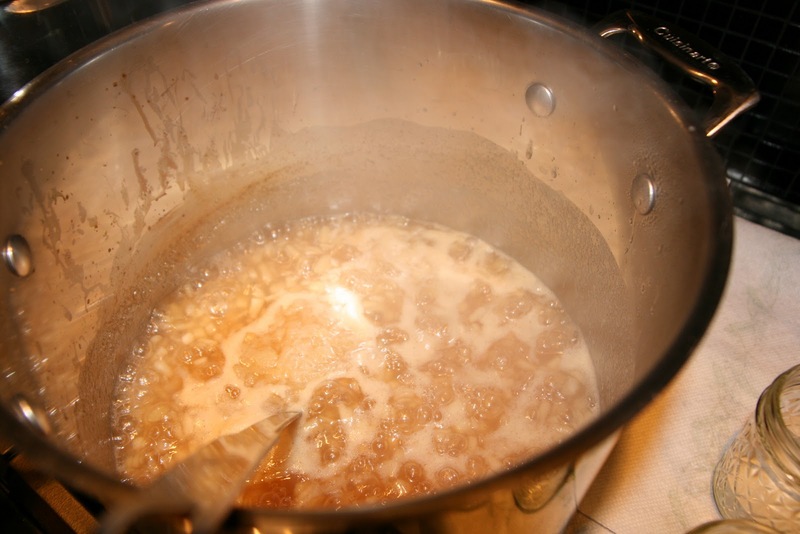 Quickly stir in remaining sugar, and return to a full rolling boil, stirring constantly. Boil for a minute or two, until the liquid drips off the spoon a little more slowly. IT WILL NOT SET WHILE IT IS BOILING. Remove from heat, and drop a spoonful onto the cold plate using the cold spoon. Put back in freezer for a few seconds, then remove. If it is a jam-like consistency, it is ready. If not, return to heat and boil for another minute, then try the test again. *One important point. 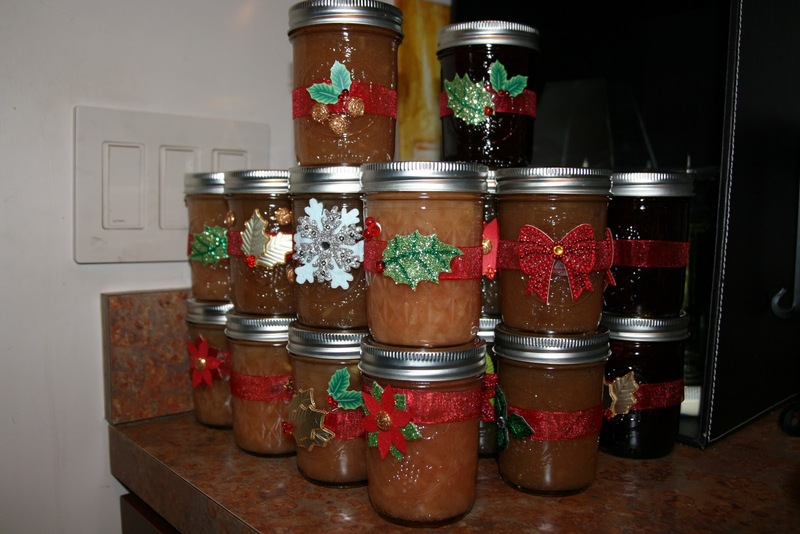 The jam will continue to set while it cools. It won’t completely finish until it’s completely cooled, which will take a day or two. If it’s too hard, it will be difficult or impossible to spread. 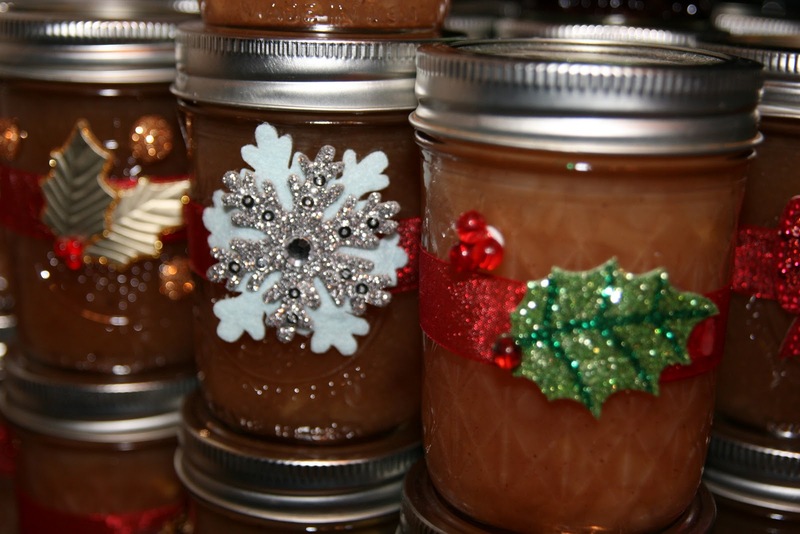 When it’s ready to be jarred, ladle quickly into warm jars, filling to within 1/8 inch of the tops. Wipe jar rims and threads, and cover with two piece lids. Place on elevated rack in canner. 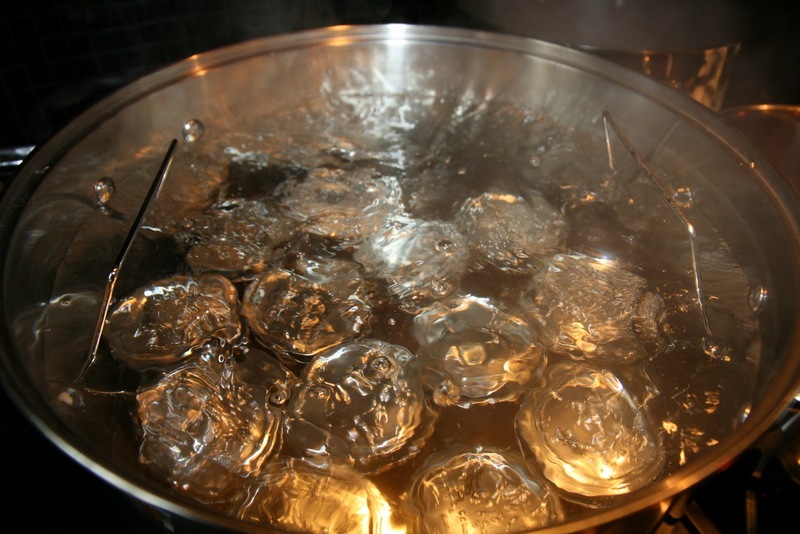 Water must cover jars by 1-2 inches; add boiling water if needed. Cover, bring to gentle boil and process jam for 10 minutes. All I can say, is my kitchen still smells like apple pie and I have a whole lot of love to give my friends this holiday season!